Photoshop is so much fun! I don’t have lots to show because most of the photos I have been working with are the ones that came in the book I am using to learn the program/application. That book is “Adobe Photoshop CS4 Digital Classroom” by Jennifer Smith. It even helped me understand Photoshop Elements and now I can do more than just resize the photos for the web. I think what I did here can be done in Elements too. This was really easy. First I adjusted the levels to get the runner to be ecru instead of brown. 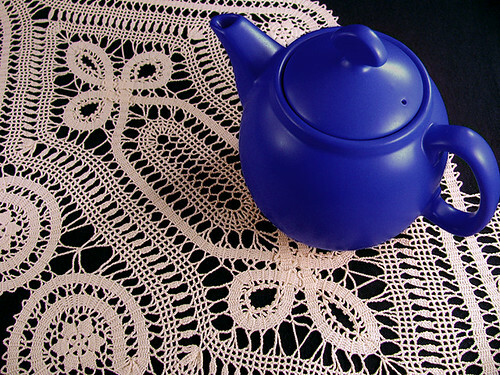 Next I used the quick select tool to select the tea pot and adjusted the hue to blue. It is so amazingly easy. Much easier than crocheting the runner. 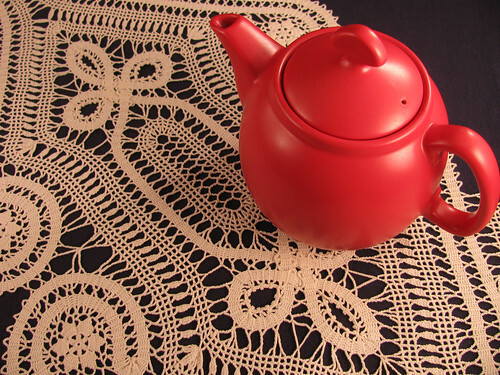 This entry was posted on Tuesday, April 7th, 2009 at 3:00 am and is filed under Crochet and Photography. Tagged: Crochet, Photo. You can feed this entry. You can leave a response, or trackback from your own site. WOW! What a difference! I just purchased Photoshop Elements 7 and totally lost….